This cool overland RAM 2500 Cummins Diesel truck with a Four Wheel Camper and XPTray flatbed is owned by René, who resides in the San Francisco Bay Area, CA. As far as the living quarters, René went with Four Wheel Camper’s Hawk. The base model itself is lightweight, at only 1325 lbs. It has a low profile, for easier overhead clearance. Also, less wind drag head on for fuel efficiency; and less impact of side winds when driving. 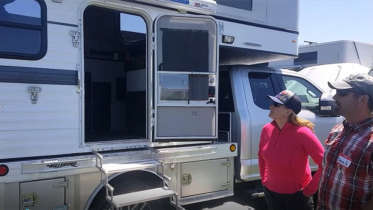 René could have gone with FWC’s larger Grandy flatbed camper, but he wanted to have more storage space, represented by the large box that sits behind the cab. This space would be occupied for seating in the larger Grandby. René has 2 setups for this large storage space: one for the family; and one for camping with buddies, where it holds a kegerator with CO2 for beer. Storage, even within the rear bumper itself. 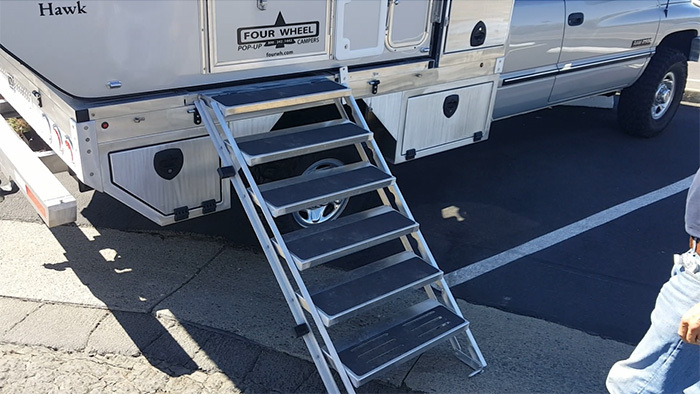 A custom platform that allows attaching/detaching of the camper from the flatbed in under 15 minutes, without having to go inside the camper to unfasten from the truck. Slide out aluminum staircase that is cleverly engineered! Heading up the front of this Overland RAM rig is a heavy-duty aluminum bumper with tubular steel at it’s core. Mounted to this is a Warn 16.5ti-S Heavyweight Winch with a 16,500 lb capacity, which can pull this Cummins RAM out of almost any situation. Very impressive overland truck – thanks René for sharing. 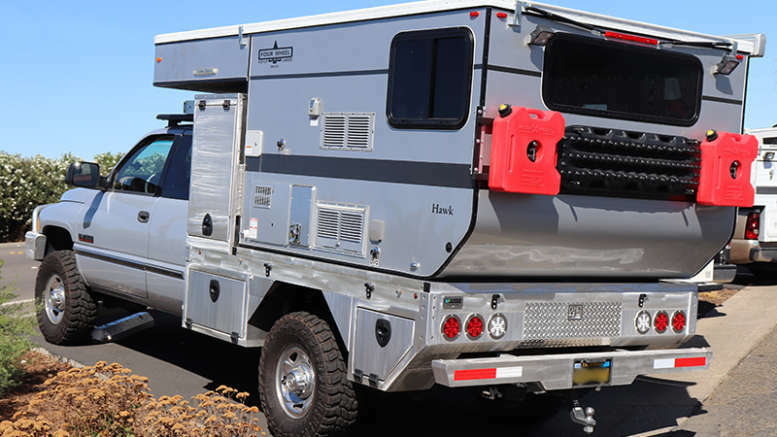 This rig is definitely a Savage Camper! 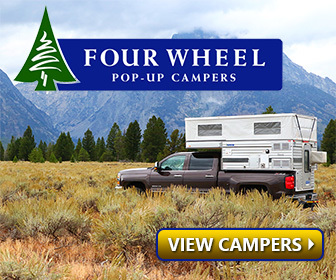 Be the first to comment on "Custom Overland RAM 2500 Cummins Truck with Four Wheel Camper and XPTray Flatbed"